With seemingly endless options, it's hard not to amass a collection of pumps in a rainbow of colors, or more than 10 pairs of black boots. So, if you're looking to make a major investment this season, or spring cleaning is on your horizon, here's an easy guide to help you streamline. A basic black pump in suede or leather is the ultimate go-to, they pull together any outfit and add instant sophistication. A barely-there ankle-strap sandal goes with just about anything and lengthens your legs. Need to add a little edge to your look? Ankle boots do the trick when paired with jeans or dresses. This menswear-inspired shoe has replaced the ballet flat as the quintessential run-around shoe. We favor a basic black or a bright color when it comes to flats. Snakeskin or leopard heels add sultry style to y our look. We also consider this print a neutral when mixing with other prints. Metallic heels are a no-brainer for an evening look—but they also look for daytime. This '90s style is making a serious comeback—the stacked heel gives you a little height without sacrificing any comfort. A fashionable sneaker is the perfect weekend shoe. Pair it with jeans and dresses alike. 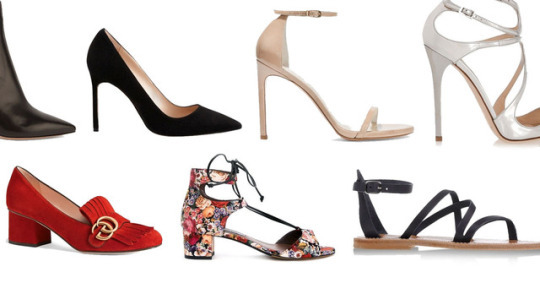 The ubiquitous summer shoe to pair with everything from cut-off shorts to a floral sundress. Tall boots, especially with a nod to equestrian style are timeless. They also add polish to t-shirt and jeans look.